Nintendo treats its star mascot, Mario, like a strict parent would a child. It controls who Mario goes out with, where he goes, and what he does when he's in the public eye. That makes sense; Mario represents Nintendo's high standards and family-friendly image. He needs to be well-dressed, well-behaved, and ready to perform impeccably when he's called upon to do so. In a strange way, Mario performs a service for "lesser" mascots like Yoshi. While Nintendo foists all its rules and regulations on its premiere plumber, Yoshi's allowed to chill, unfasten the top button of his metaphorical pants, and let his belly just kind of spill out a little. 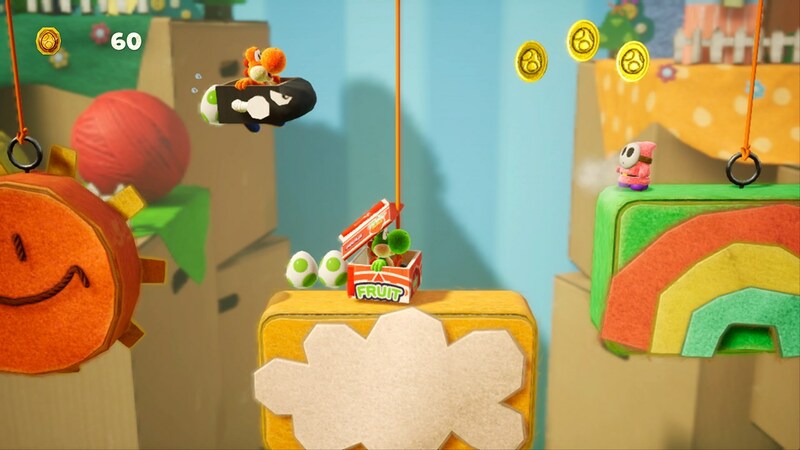 Yoshi's Crafted World continues the tradition of most Yoshi games released after 1995's Yoshi's Island for the SNES, i.e. it delivers a very easy-going adventure that's more about exploration than tough platforming. It might not challenge you, but it'll almost certainly delight you. Just don't expect a gripping narrative to lead you down the road. If you think Mario stories are bland, baby, Yoshi's Crafted World makes "The Princess is in another castle" seem as profound as War and Peace. The long of the short of it is, the Yoshis living on Yoshi's Island guard gems that are scattered by Baby Bowser (not to be confused with Bowser Jr.) and his minder, Kamek. Yoshi needs to travel through several uniquely-themed worlds to get them back. That's about it. 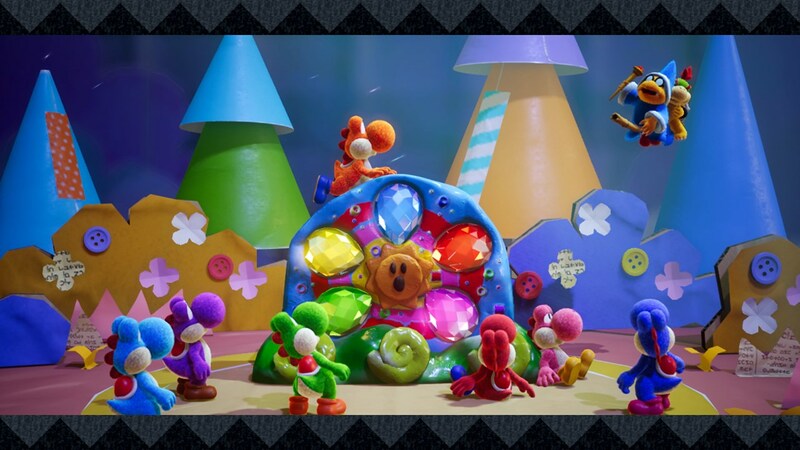 To be fair, Yoshi's Crafted World doesn't need a story beyond "get these sparkly things," because the worlds Yoshi traverses are big sparkly things in themselves. I've already talked at length about the inventiveness and cleverness of the game's graphics, but I feel like I can't overstate how wonderful Yoshi's Crafted World looks. Whereas traditional Mario games pack several levels into a handful of themed worlds, e.g. jungle worlds, desert worlds, and sky worlds, Yoshi's Crafted World opts for a wide array of worlds that offer a few levels each. You're never offered a chance to get bored with the game's whimsical looks, nor will you ever get tired of just wondering at how inventive its graphics are. I would've loved the chance to sit in on the development process for Yoshi's Crafted World just to listen to its artists tackle traditional level design in the context of a grade school arts 'n crafts project. Is the end product a little bit childish-looking? Maybe—but I don't believe anyone with the slightest interest in the evolution of game graphics will be anything short of amazed with Yoshi's Crafted World. While I believe the graphics in Yoshi's Crafted World can melt the hardest heart, I imagine its gameplay won't inspire the same universal level of reverence. As was already mentioned, Yoshi's latest adventure is easy-going; it's not engineered to make you whittle away lives as you perform tough jumps over hazards. It's not as if you're never challenged, but like Yoshi's Wooly World before it, Yoshi's Crafted World wants you to explore its strange lands and drink in its unique atmosphere more than it wants you to sweat (though the game's 2.5D perspective occasionally makes navigation tricky; its easy to forget Yoshi can sling eggs into the background and foreground, as well as left and right). As per Yoshi game tradition, each level has several Flowers for you to collect. Some are hidden around the stage, but others are only won after you collect a certain number of coins, red coins, and / or finish a level with a full health meter. Moreover, each stage has a "flip side" that tasks you with collecting Poochy's wayward (and adorable) puppies for even more flowers. While you're blocked from entering new worlds unless you present a certain number of Flowers, you should be able to garner more than enough if you enjoy Yoshi's Crafted World at a pace that lets you explore nooks and crannies—a pace that lets you stop to smell the flowers, so to speak. The base game isn't difficult to breeze through, but grabbing every collectable takes a lot of time and exploration. It's not a bad idea to pair up with a friend via couch co-op if you plan to give every stage a good scouring. Between its whimsical graphics, its laid-back difficulty level, and the sheer fun of pelting enemies and objects with Yoshi's eggs, Yoshi's Crafted World is one of the best adult-child co-op games the Switch has to offer. I personally love how Yoshi's Crafted World emphasizes exploration, and how well that emphasis pairs with its tinfoil paths and Tempera skies. But I also believe the Yoshi series wouldn't lose anything if it returned to its earliest roots by giving us a seriously challenging game that still encourages us to look for secrets while risking death. Since the first Yoshi's Island is the only Yoshi game that still gets my fingers in a serious jumble, I'm going to assume Nintendo decided on a permanent direction for the series once the sugary-sweet Yoshi's Story hit the N64. I can live with that—but only if Nintendo beefs up Yoshi series' weenie soundtracks. Yoshi's Island gave us the legendary Athletic Theme, but the music in Yoshi's Crafted World has all the energy of an asthmatic kid piping on a cheap recorder. Why? Despite its lack of serious challenge, Yoshi's Crafted World won't have a problem finding a well-deserved audience on the Switch. The flip-side worlds and myriad collectables will potentially keep you busy for a long time, and you probably won't stop exclaiming about everything is "so effin' adorable" for as long as you play. The game's an especially easy recommendation if you keep company with a kid who loves to game alongside you. Yoshi and Mario work well as a team, but the little dinosaur shows his best side when he's allowed to take a separate vacation and do his own thing. Tagged with Action,	Family,	Nintendo,	Platformer,	Reviews,	Switch.